Alone in a York hotel, I put down a simple gated pad melody. Realising it wasn’t quite biting through, I treated it to a dose of compression. The standard logic unit was grabbed, as always, and my favourite ‘Acoustic Guitar 1’ preset did wonders. A dash of stereo delay made it stand out yet further over the bed of bit-crushed, arpeggiated strings I’d bounced to audio moments before. I would have gladly handed over an important body part to have been able to do that back in 1996. But to do it with such ease? On a laptop? In a hotel room? Without spaghetti cabling? Well, said body part would have come with a free member of the Ellis family. It’s a boring cliche, but it is astounding just how quickly technology moves on, particularly in the world of audio and midi production. I can do anything I need to on my laptop. Aside from a tiny contoller keyboard, I don’t need anything else. Samples, synths and effects are all a few clicks away and putting them all together is an unbridled joy. I’m in York on business, yet I’ve been able to bring my studio with me, hidden safely between tomorrow’s suit trousers and pants. Such portability wasn’t really present back in the mid-nineties when I made my first significant jump into what could be described as ‘serious’ gear. Living at home and working a well paid weekend job with dad’s band, I had plenty of disposable income. 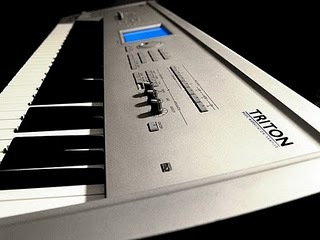 It was therefore only natural that I started what was to be a long-running addiction to buying studio equipment with my first big purchase: the Korg Triton. I’ve never been as excited as I was in the days leading up to it’s delivery. Having played it’s predecessor, the Trinity, at a trade show a year or so previous, I knew very well what this thing would be capable of. And I wasn’t dissapointed. The flagship workstation sounded like nothing else I’d experienced. A world away from the TG300, it offered a lush sound palette and complex onboard effects. Add to that a sampler and a little ribbon you could rub to make everything sound even more wonderful and I was quite literally in geek heaven. It’s also worth highlighting its continued presence today both in commercial studios and, more predominantly, on the road, where its workhorse capabilities are still relied upon by some of the most skilled professional keyboard players in the world. One moment stands out for me during my early days with the Triton. I had finally mastered the art of sampling and had successfully captured a beautifully played Gilmour solo from Pink Floyd’s live album, Pulse. Then I found the reverse button. Within a day or so, I’d built a track around the now ethereal sound which resembled anything but an electric guitar. I clearly remember saying to myself, “wow, I can do anything now…“; there was finally sense of the freedom I’d yearned for which would allow me to create the music I had in my head. As much as I still hold an affection for the days of the Atari and TG300, they were limited and as I reached my teens, I became increasingly frustrated with what I wasn’t able to do.